The last meeting of the South Coast Pie and Beer Club on Grouty Ridge went really well, so I was keen to book this venue again in mid-November. Since October, the South Coast saw quite a bit of rain up into the alpine, and the lower elevation snowpack disappeared. 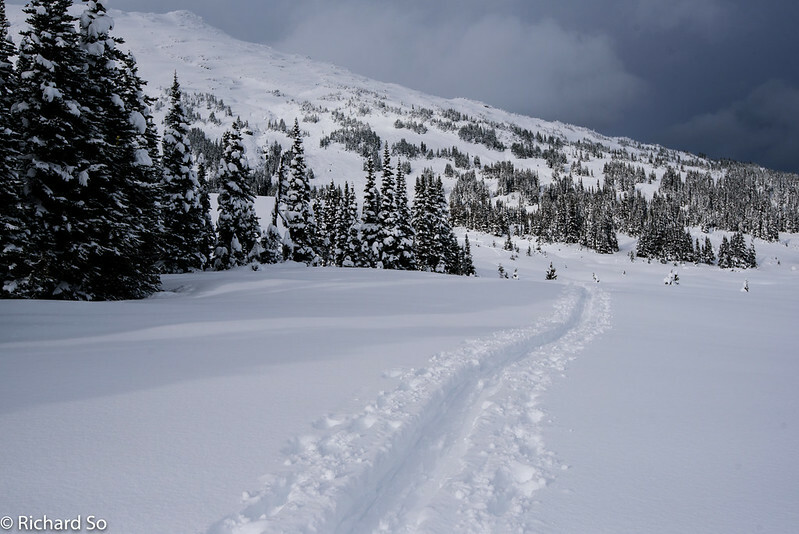 There was just a solid crust everywhere that retained snow coverage, followed by 30cm of low-density snow to mark the start of a significant storm cycle in late November. This storm cycle was enough to bring the snowpack back to above average again. 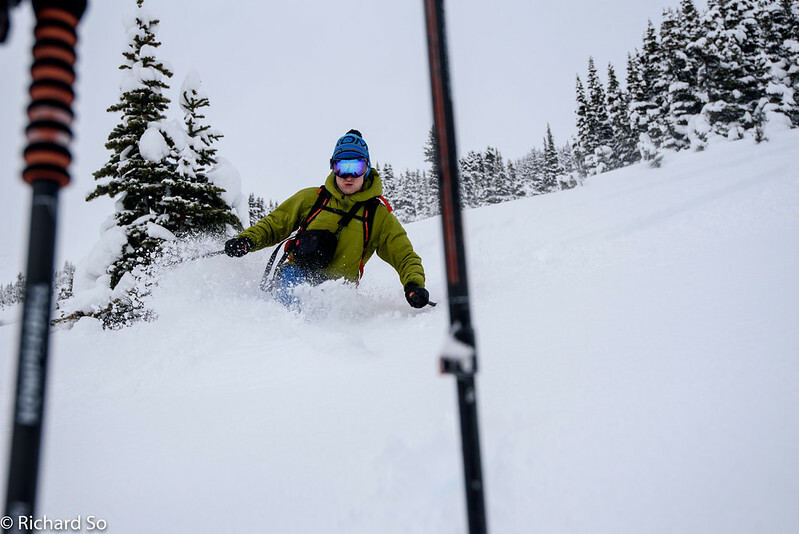 There were still some good options for early season skiing before this storm cycle arrived - somewhere with high road access, minimal forested terrain, and smooth slopes were still the best bet. 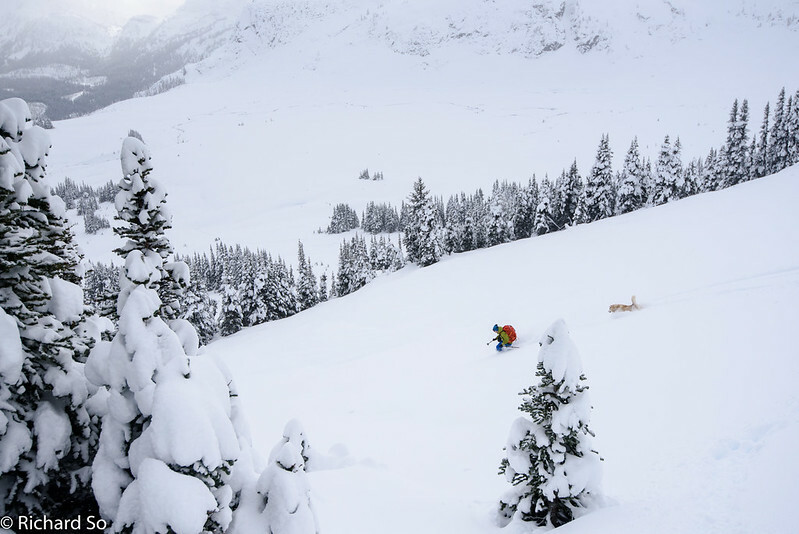 Some early season options that worked out well this year included Metal Dome, Brandywine, Blowdown Pass and Downton Creek. With the Hurley still drivable, and the last time this season, Alex Maddy and I decided to check out the access from the east side this time. Harrison ready for another bumpy drive up the Hurley. We hit snow just after the Tenquille Lake turnoff, 10-15cm on the road. While the South Coast Pie and Beer Club meetings sound a bit official-like, the members of the clubs are generally a bit disorganized and just as flakey as the two things they love. I was a little concerned about how much snow would fall overnight on Saturday, so I wasn't sure if driving far up a logging road was a good idea. 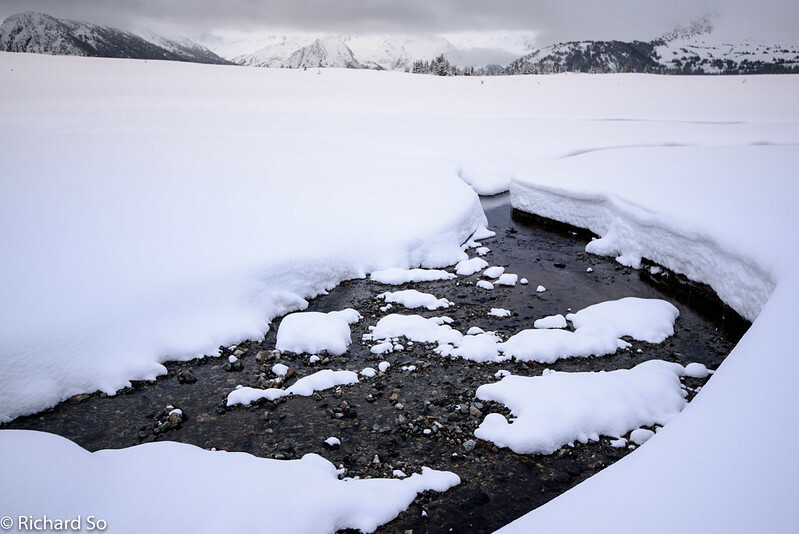 The Hope Creek road network offers easy access to the alpine in the summer, with some great meadows and open alpine terrain to explore. My last trip up here took us up the east fork of Hope Creek, checking out the Beaujolais and Mystery Peak area. We figured with the 1600m freezing levels, the precipitation would mostly fall as a rain where we parked. We drove up to the Hope Creek FSR, up to the South Branch, approximately 7km. 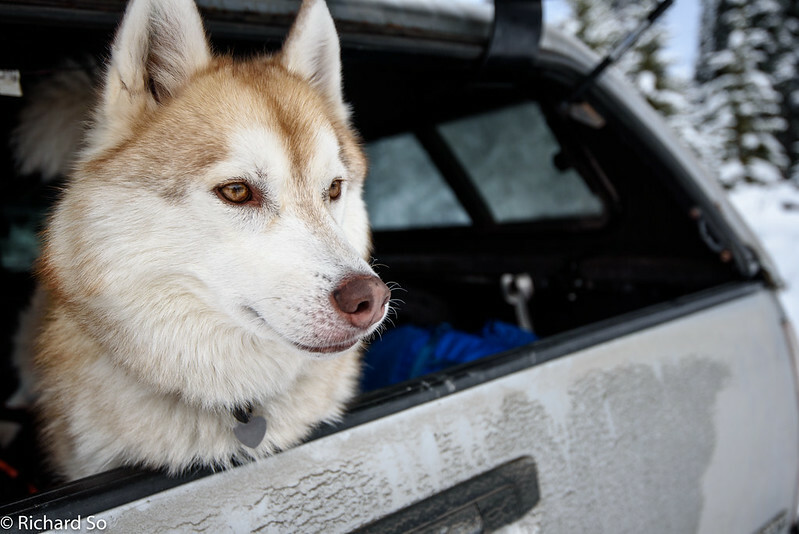 At times it felt like we were going snowmobiling, driving up the snow covered road. There were some recent tracks from hunters, down to the gravel to follow in. We skinned along the South Branch of the Hope Creek FSR, to the cat road shown above. The cat road climbs from 1450m up to 1650m. Travel on the road was fine for going up. There was no base, so every single rock was hiding under a thin covering. 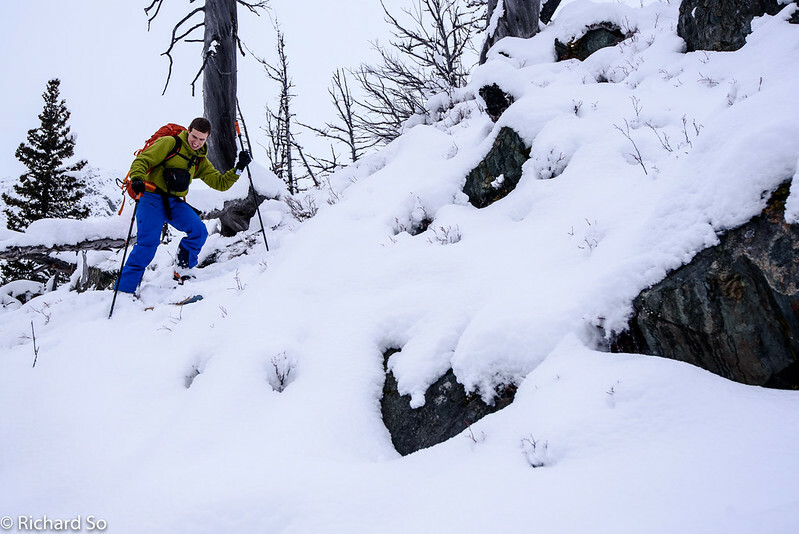 Fine for skinning, but going down would be problematic unless it snowed 50cm overnight. And then the truck would be stuck. This deadfall over the road was a sign of the fun to come. 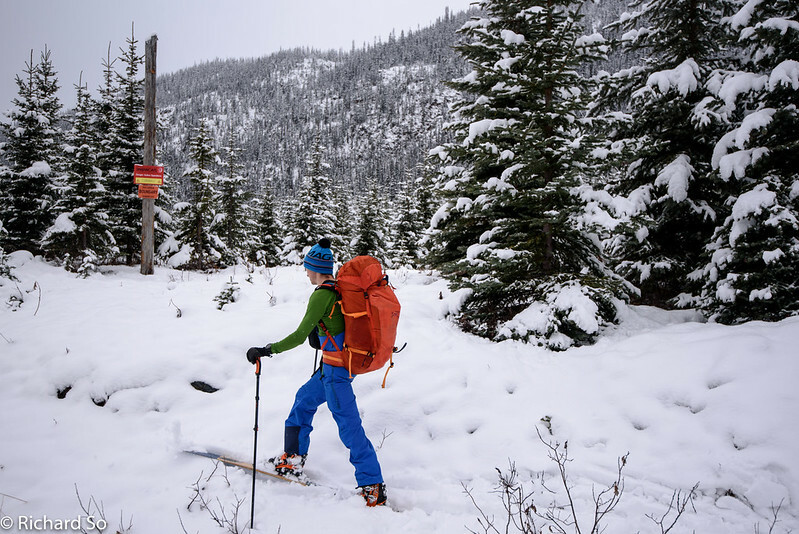 This 500-acre area on the east side of Grouty Ridge is known as the Black Forest by the snowcat company, and offers a unique experience of skiing through a burnt forest. There's not a lot of places like it in the Sea to Sky area. There are a few similar areas in Manning Park, though. 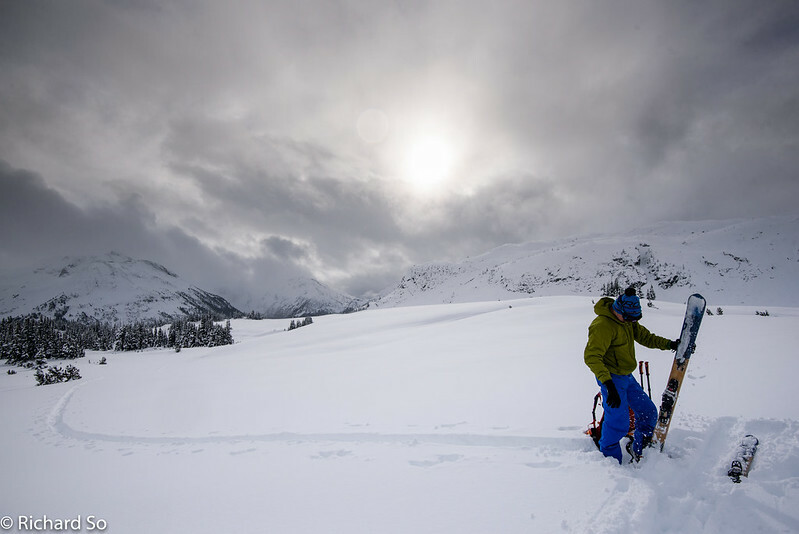 For us early season keeners, though, there was just enough snow to make the skinning very sporty and unpleasant, frustrating at times, yet too much to walk around in. 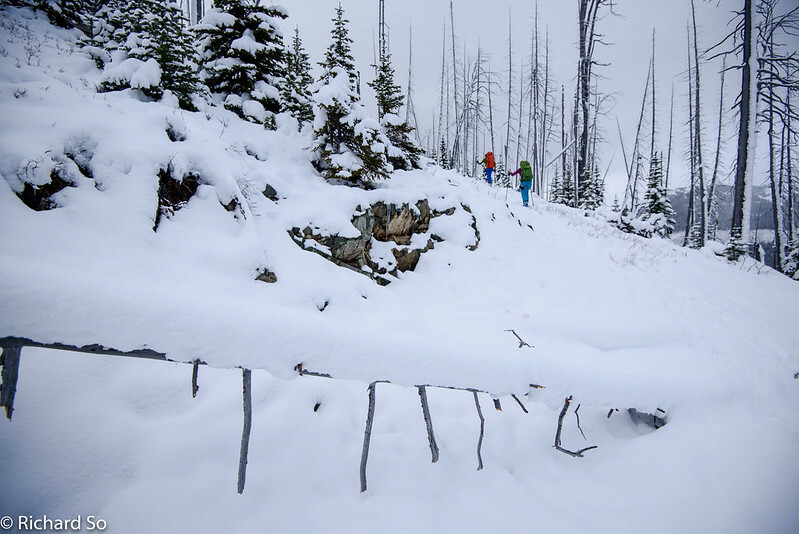 Burnt forests are generally a good place to avoid in the early season unless you like grinding log rails uphill. The burnt forest was annoying but short-lived. 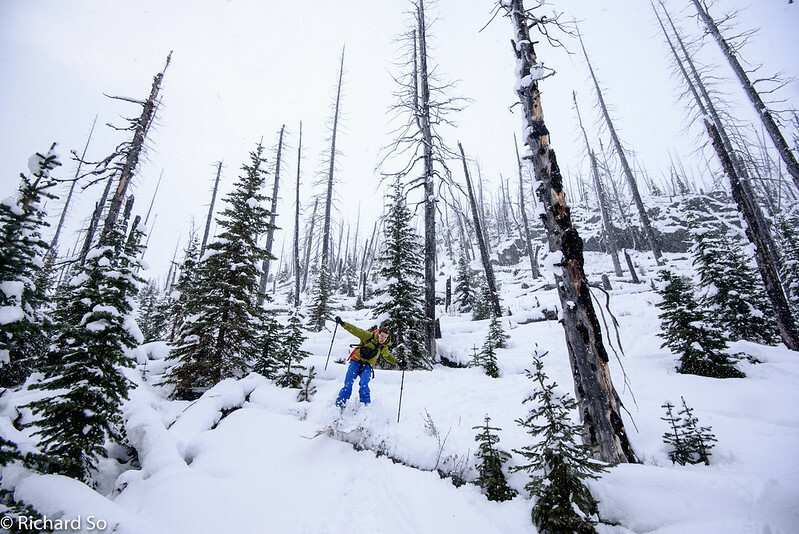 There were only a few ugly skinning manoeuvers before we exited the burnt trees and into the deep early season snowpack again. Up in the meadows here, the snow depth was about 100cm, similar to where we saw at the end of October. 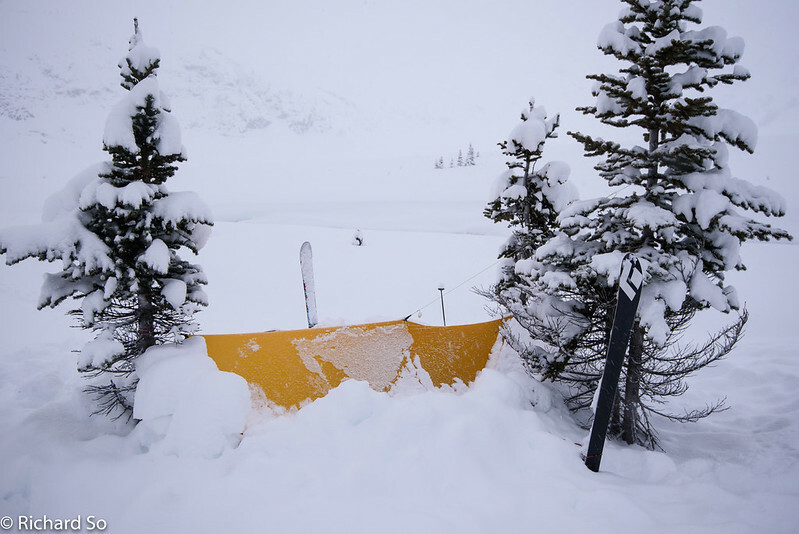 There wasn't much time to ski by the time we reached camp, after having a slower than expected start to the day. The approach wasn't particularly long or hard, it just took us a while from the time we woke up, to actually skinning away from the car. 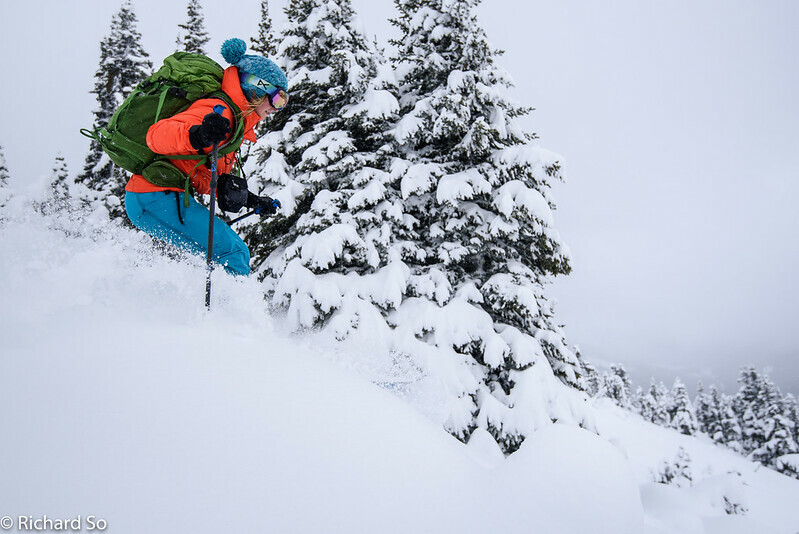 With early season skiing, it's important to set your expectations low. We saw this little cooler last time while skiing in the area. Alex got to pick the warmup run for the weekend, and naturally it was the steepest option around. Maddy, Harrison and I followed his boot pack up. 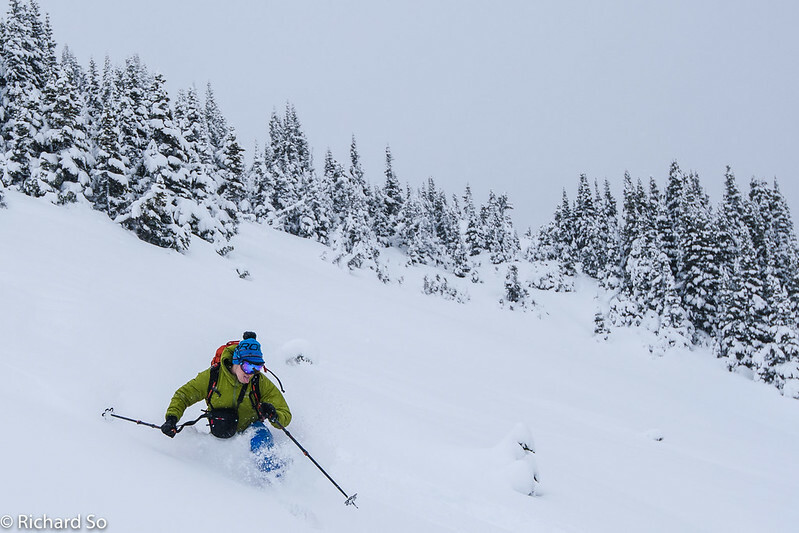 The new snow felt well bonded to the crust, 20-30cm down so I felt comfortable heading up. There were some obstacles at the bottom of the cooler, one or two pillows with rock showing before, the coverage wasn't complete. 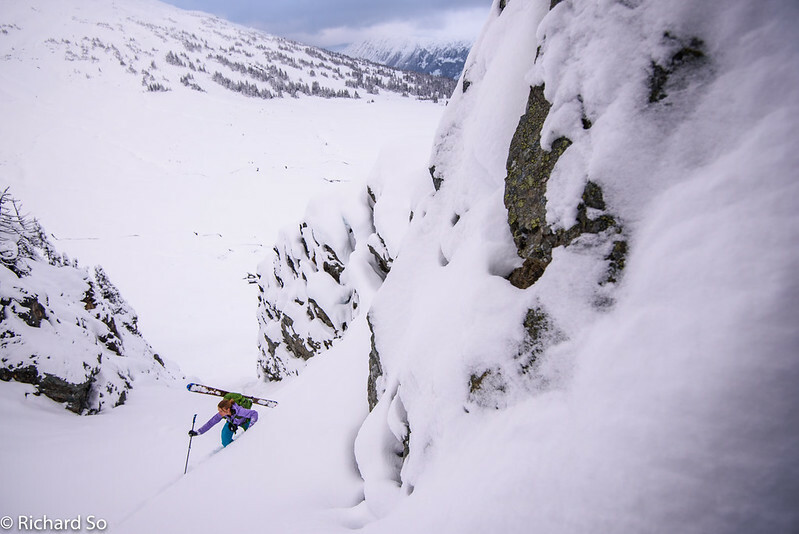 The snow characteristic changed up in the choke of the couloir with some more wind effect. I also a little concerned about the upper section which was more open to the wind, so I was happy to just stop here. Plus I wasn't fully confident in my abilities on skiing the steeper variable snow above, especially as the warmup run, with my noodly rock skis. Alex made it look smooth and easy as always. Alex skiing in the cooler. Maddy skiing down the cooler. 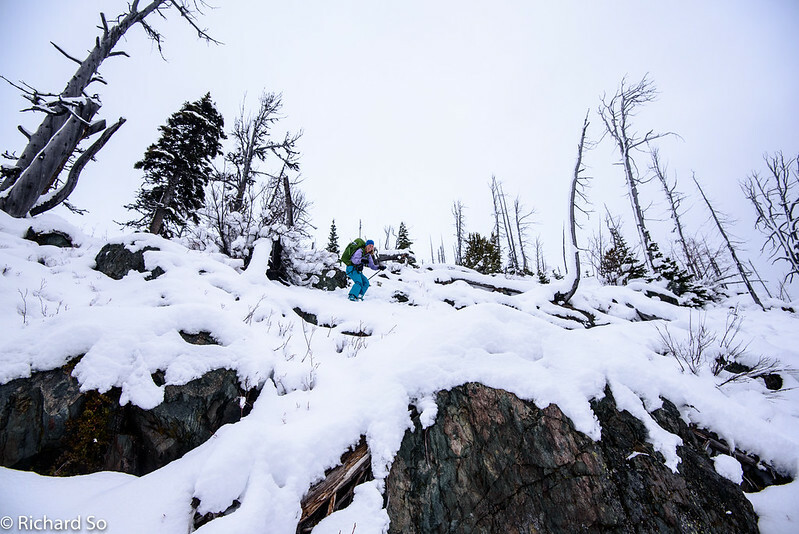 We skied the glades at the top the next day. These steep turns were fun, but the light was flat and it was getting dark. 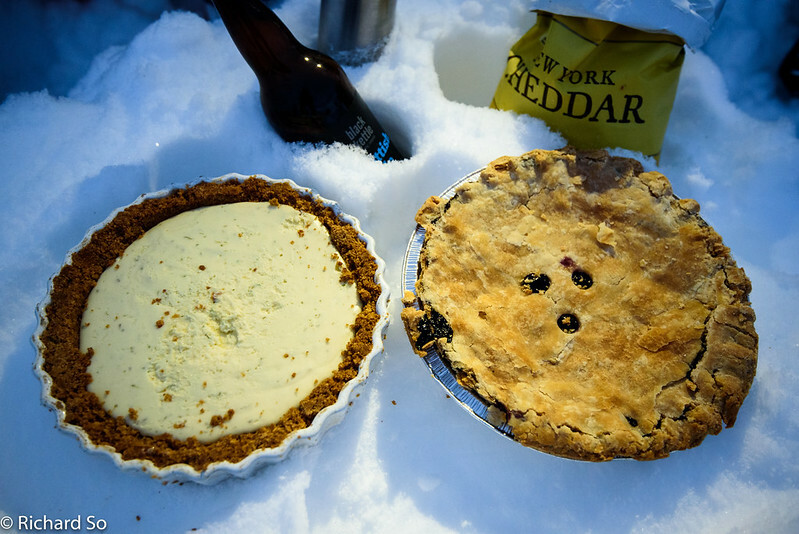 Key Lime pie, and Blueberry pie. This was a fast and light trip. I left the oven at home, and brought the space-age ceramic dish to save weight. 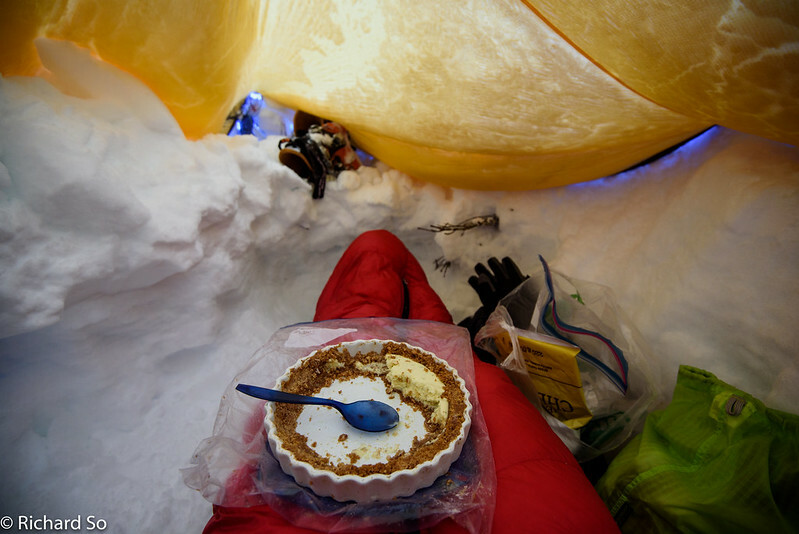 The pie was a lot like the snowpack on the trip - a firm crust with a delicious filling on top. 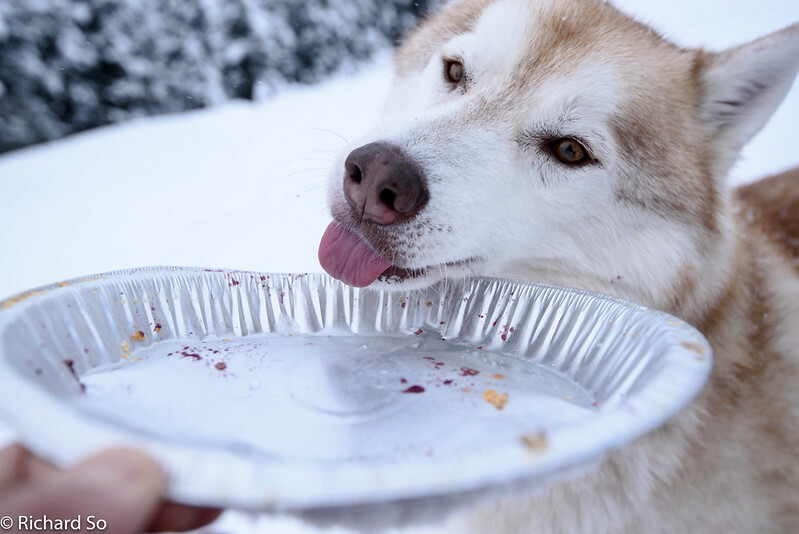 Hopefully, my pies will evolve as the coastal snowpack develops this season, and provide a good reflection of current conditiosn. 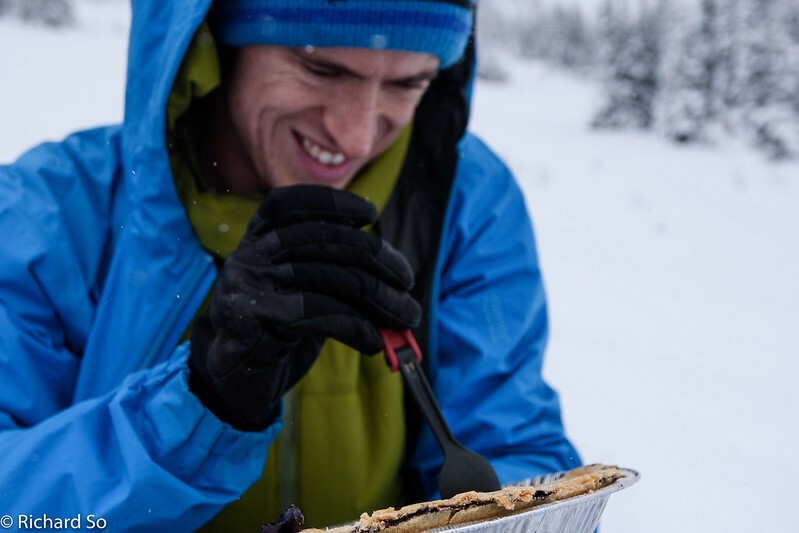 Two pies for three skiers is a good ratio. Pie Smiles are quite common at these South Coast Pie and Beer Club meetings, my favourite kind. I used the two trees to pitch out the tarp in an A-frame style. 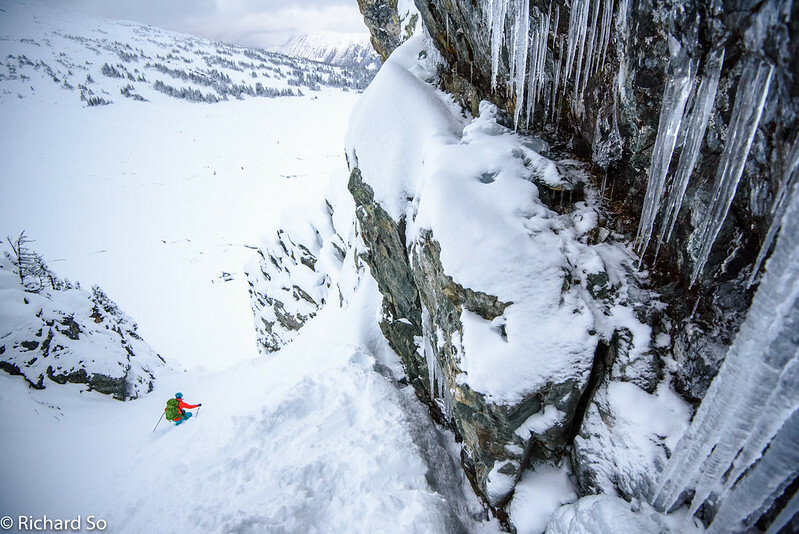 Ski poles and skis are used to guy out the sides. 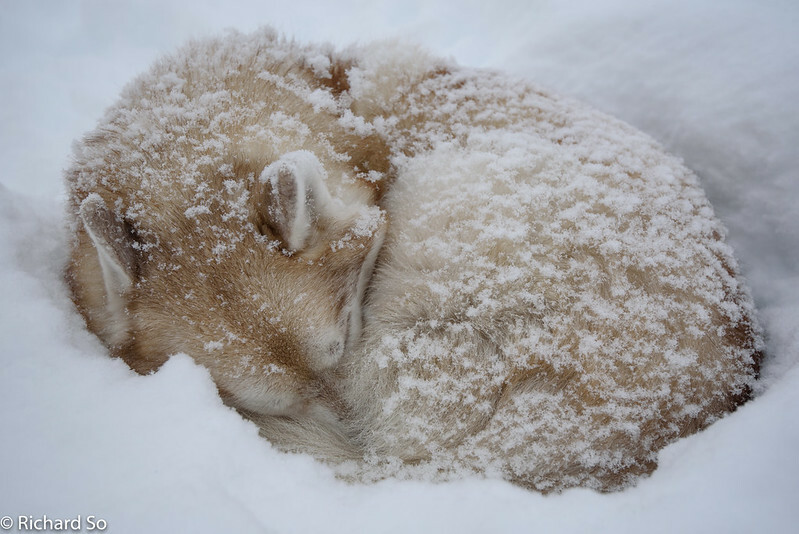 I dug a trench into the snow for sleeping in. This set up works well, as long as it doesn't snow too much overnight. 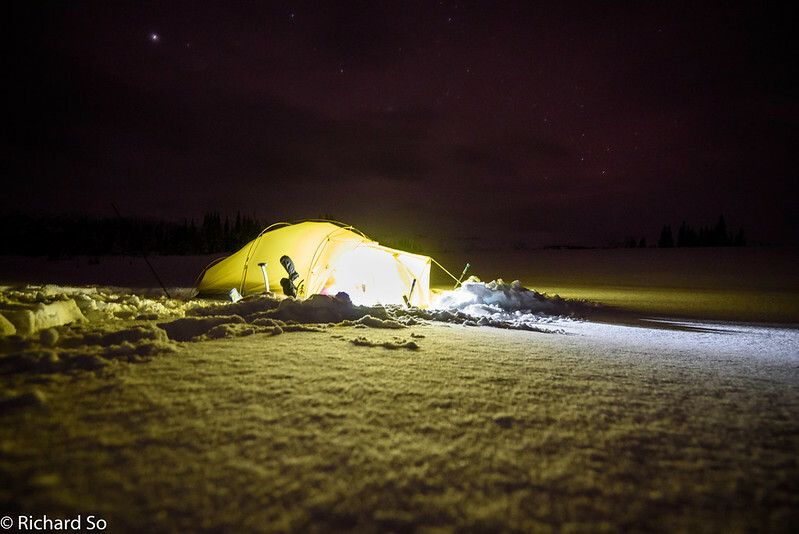 If the tarp isn't set up with steep enough sides to shed snow, even only 10cm of snow can feel like a lot and cause the tarp to sag down. With this setup, I never had to go outside to brush off the snow. Every tarp setup is a little different, and that's probably why I like it rather than just bringing my tent. Plus, this is lighter. You have to save weight somewhere to bring pie. 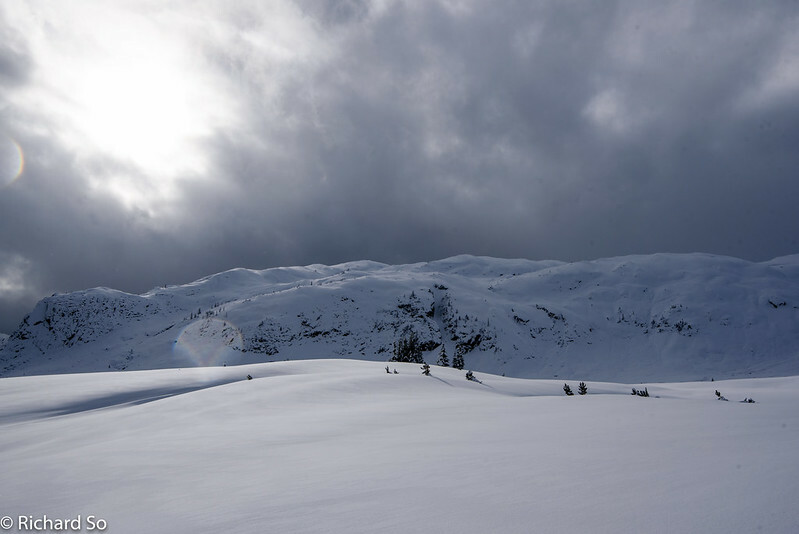 It snowed 10cm overnight, for a total of 32cm over the melt-freeze crust at 1850m. Total snow was 90-105cm in the area. 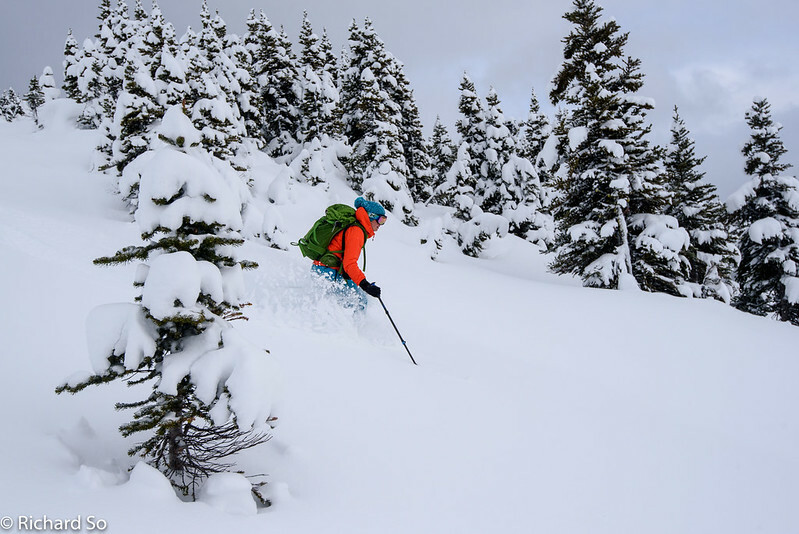 The temperatures hovered just around freezing, but the snow quality remained good and we went off in search of turns. 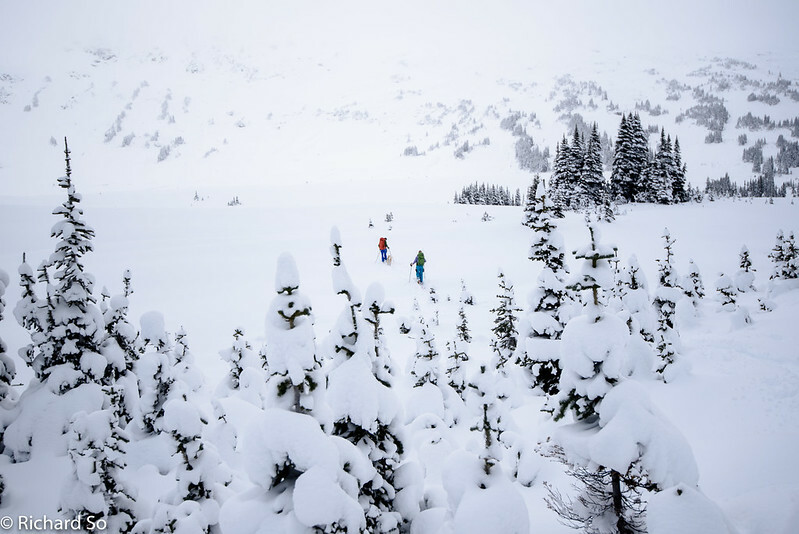 The weather was supposed to be worse on Sunday, so it was important to pick a destination that offered skiing even in low-visibility conditions. 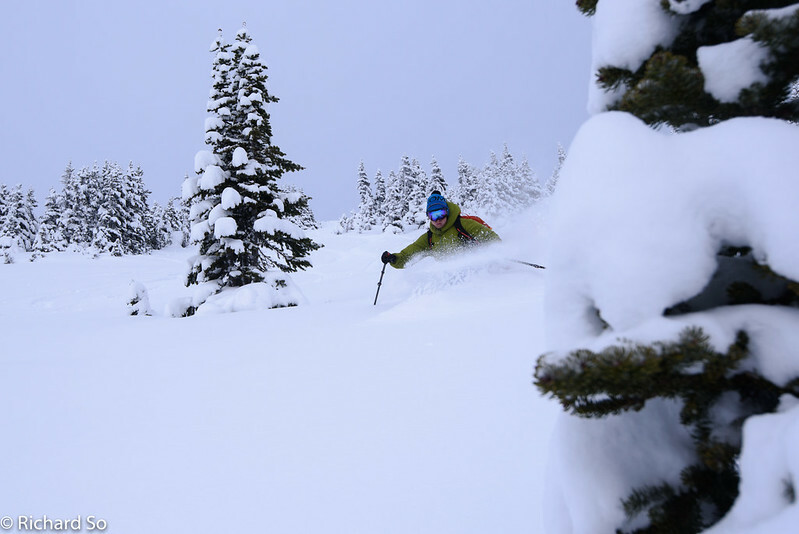 The glades between 1850 and 2000m were a good option for today. Harrison and Maddy on the first lap down. 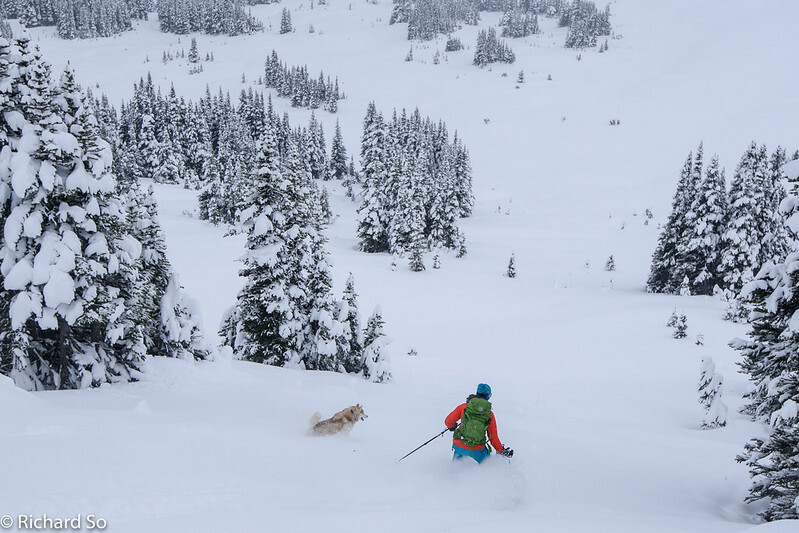 Ski quality was excellent, with most of the underlying hazards mostly covered up. 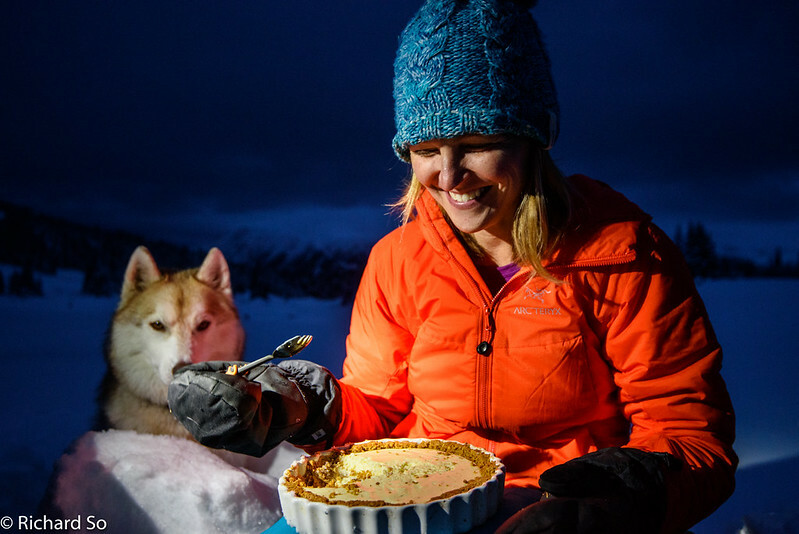 We also enjoyed laps of pie and calzones in between the skiing. Even Harrison got a little bit of pie. The logging road at the top gives quick access up to the area on the west side of Chipmunk Mountain. There's something wrong with Alex's facial expression. It's too serious. Alex, you forgot to stick your tongue out. Moody skies. The sun even came out briefly, and the sunglasses that I always bring along just in case came out. I guess I'm an optimist. 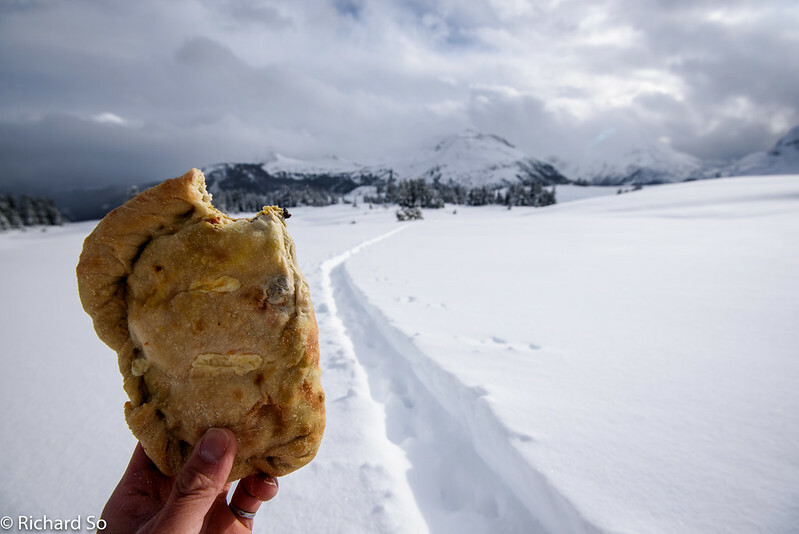 Enjoying a calzone break in the sunshine, in between feasting on the powder. The cooler that was skied is in the centre. We went about halfway up. 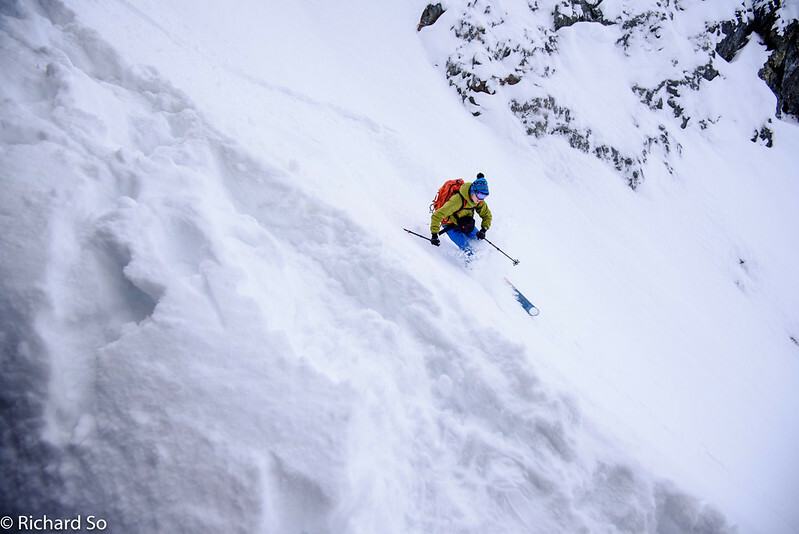 Back in late October, we skied from the ridge top, and down from the centre to left along the shallow gully/bowl. Back to camp to pack up, and looking back at the terrain that was skied. 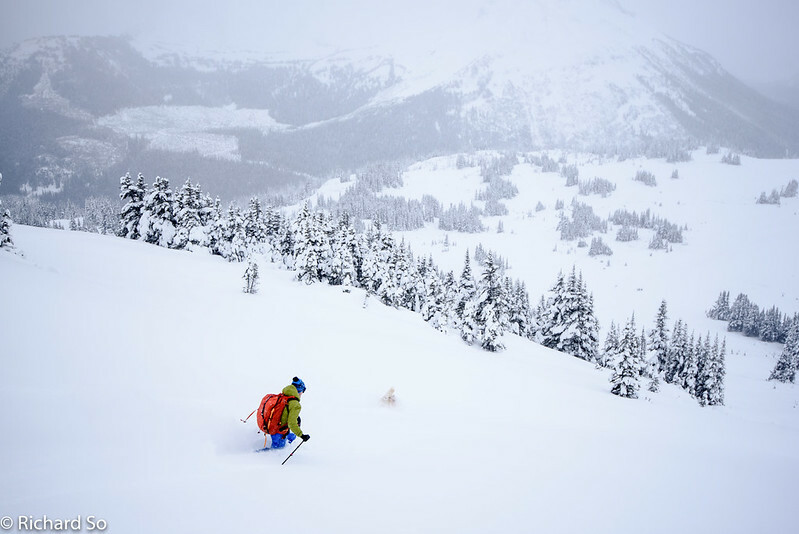 On the last trip when the weather was better, we skied to the top of the glades and continued up and left to the ridge top.below Mortar Peak. We kept to more conservative terrain on this trip. 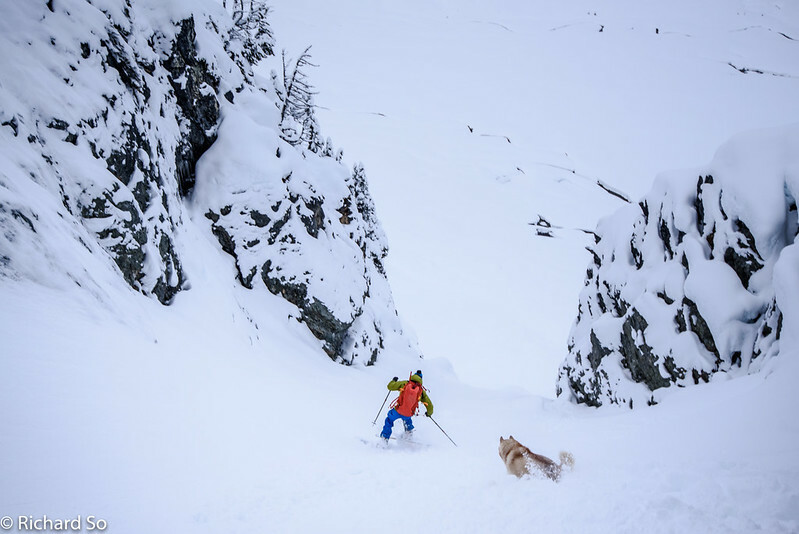 I don't mind skiing sunny powder, though. Getting down through the Black Forest was definitely the crux of the trip. I was worried about getting down through here, so we gave ourselves plenty of time and daylight to make it through this section. It sucked, but it was still better than I thought it would be. 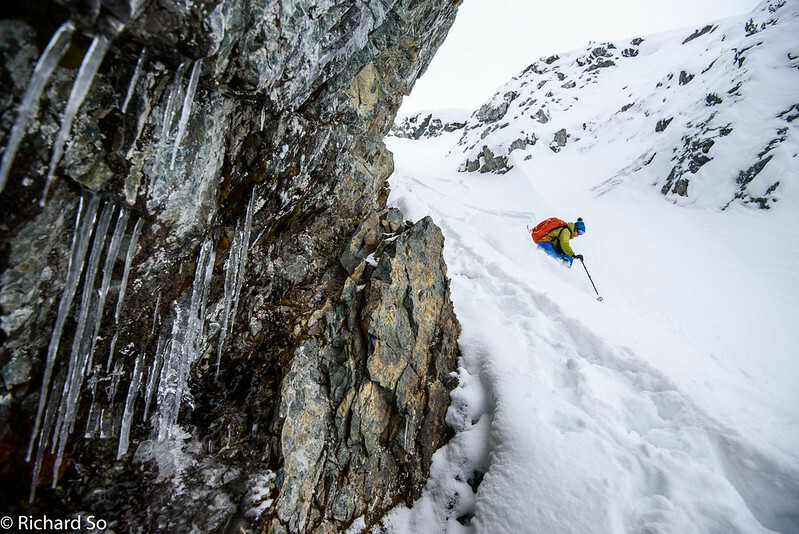 I scraped up my skis against quite a few rocks, as I slowly sidestepped and made kick turns down the slope. This is fun, right Alex? This section was flatter, and with a little speed you could plane over most of the obstacles. There wasn't enough snow on the cat road to ski without seriously damaging your skis or yourself. The skis went on the pack and we walked down the road. 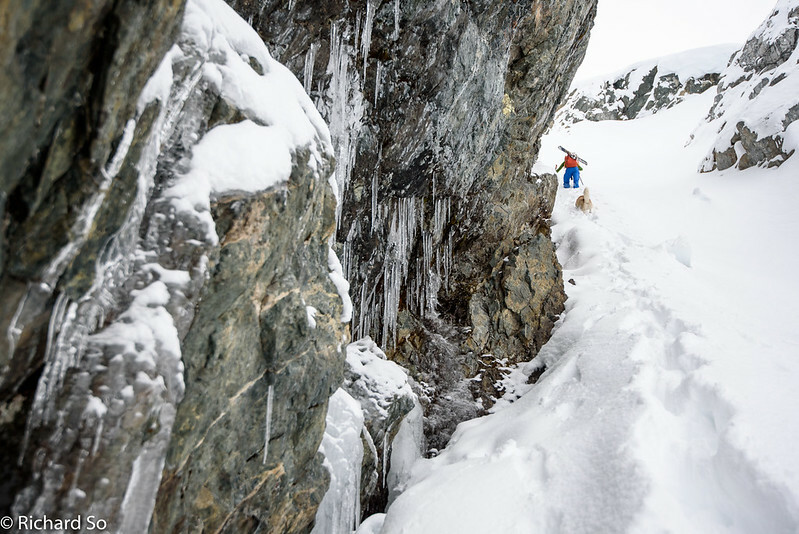 We skied back along the south branch, back to the truck where it was now 3C and raining at 1450m. We didn't have any issues driving back out the Hope Creek FSR, which was still a thin layer of snow and ice. 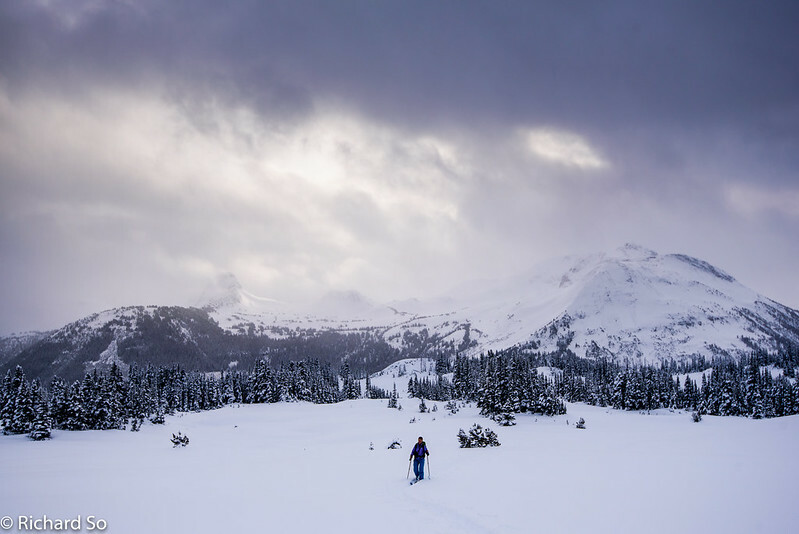 The south side of the Hurley was significantly snowier, though, with 15-20cm of new snow at Railroad Pass and down to the Tenquille Lake turnoff. This would be the last time the Hurley was drivable this season. 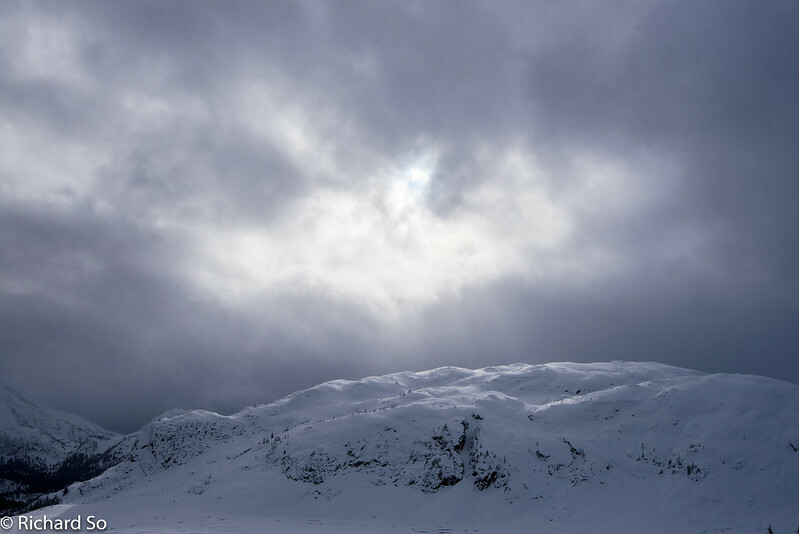 A few days later, there was over a metre of snow at the summit. 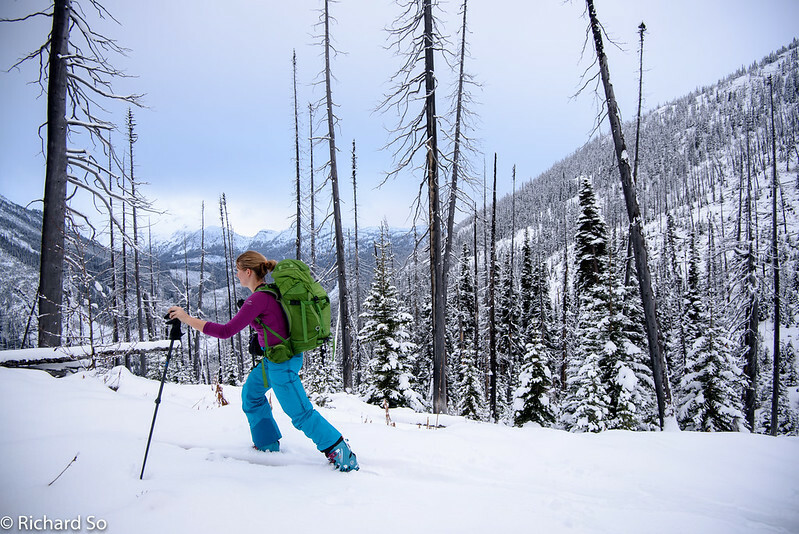 I liked exploring a different access to Grouty Ridge, but I think for early season and late season skiing, taking the route directly up from Railroad Pass is the way to go. 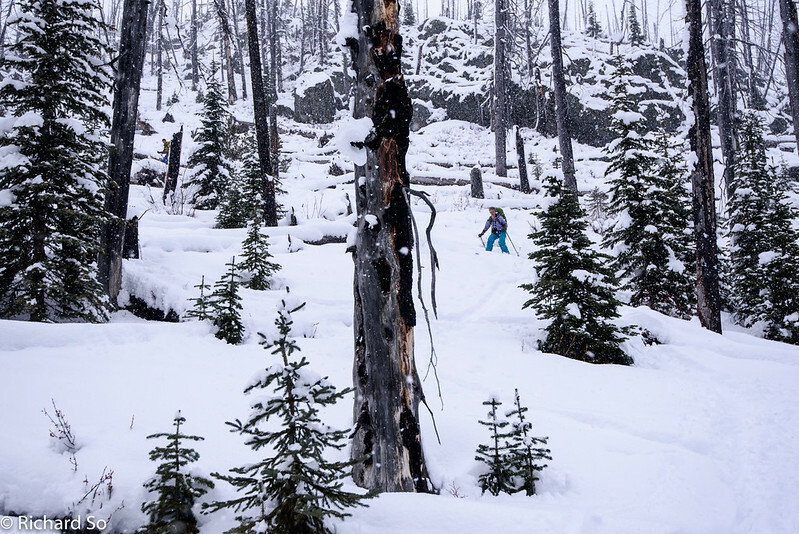 The burnt forest was unpleasant with a low snowpack, and there are better options in Hope Creek for early season access when the roads are still drivable.